A good papercraft designer will make a papercraft template for a celebration and release it a week before the D-day. 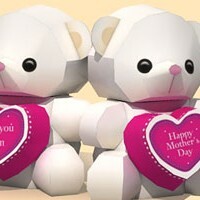 Mother's Day is tomorrow but I just release it just now, one day before D-day :p. Another printable cute love bear papercraft for you to build as gift for your mom at Mother's Day. The template is quite simple, only has 3 pages of patterns. There are 3 phrases for you to choose or you can write your own greetings. The complete papercraft height is about 12 cm. I hope you have the time to build it if you want to build it, Happy Mother's Day. This cute paper craft set was submitted by John Scheers from Dewmuffins. 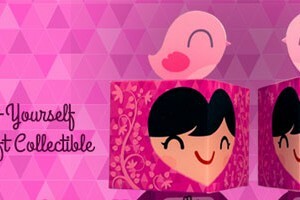 He also created this cute paper craft template. This paper craft is really cool, a set comes with two paper crafts, one for you and one to give to a friend. What's unique about this set is that when they are joined together they make a single smiling face signifying the love and friendship between the two of you. The pink birdies represent your connection when apart, the birds will sing to each other from great distances to let the other know they are thinking of you. A sad bird is also included for those times when you miss your friend and wish they were by your side. There is also a place on the front to write your name as well as your friend's name. John also sent the template to be hosted in paper-replika.com to be shared with us, thanks John :). The last Halloween paper craft that I made was in 2010. I don't remember why I was absent in the last two years, but I know I nearly absent again this year :). 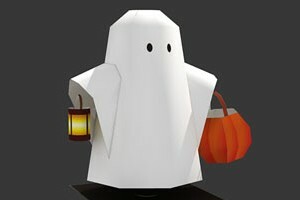 I posted on Paper Replika Facebook page asking what paper craft for Halloween, they are many answers from ghostly character to unrelated character, from diorama to haunted house. We naturally are not celebrating Halloween here, so it a bit hard to tune in the mood. I already try making a haunted house but I lost my mood, it was difficult :). So I turned to the most basic traditional thing that related to Halloween, ghost and pumpkin, again lol. This paper craft is quite simple only need 1 sheet of paper you can make your own Halloween ghost. The idea is, I made this paper craft like it is floating, also the pumpkin basket and the lantern also floating. 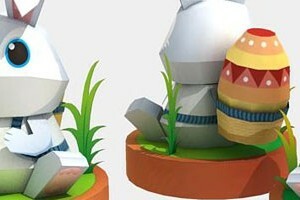 Just like Christmas 2012, I don't want to missed releasing a related paper craft model in Easter this year. So I prepare this pattern early, although Easter is still in March 31st. This paper craft patterns is a quick modeling, done in a day. I choose Easter Bunny because a very common symbol of Easter celebration and also a symbol festivity around Easter dates that widely accepted even for non Christian, just like Santa in Christmas. The symbol itself actually the eggs, that often carried by a rabbit, that is called an Easter Bunny. This template contains only 2 pages of patterns, you can choose which bunny eyes you're going to make or make them both. The last Christmas themed paper models I made was 3 years ago, in 2009. Two years in a row I did not have enough time to make it in time. This time I made an early start at the beginning of the month. The spirit of Christmas is everywhere already, so I have more than enough inspiration to make a paper craft for this 2012 Christmas. 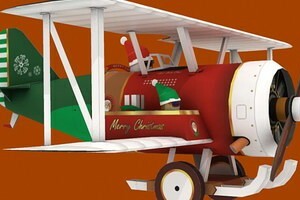 This time I made a Santa's vehicle other than the usual, which is a biplane. It is manned by 3 people, Santa as a pilot and two elves sit in the left and right wings. Their job is to drop gifts to the good kid, they tied a parachute on each gifts. The biplane is equipped with sleigh so it capable of snowy surface landing.